We visited the Bellini Lounge to sample some of their cocktails. 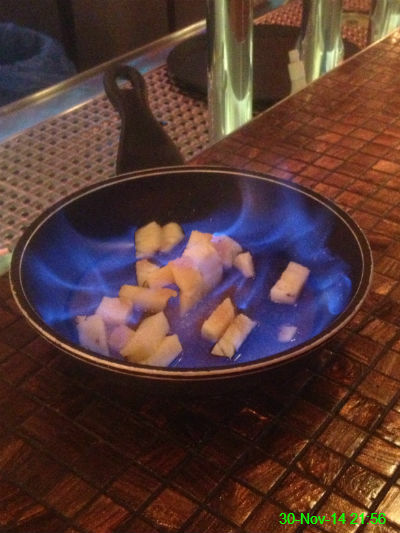 Michael opted for a flaming pina colada which meant we got to watch the pineapple toast in front of us. 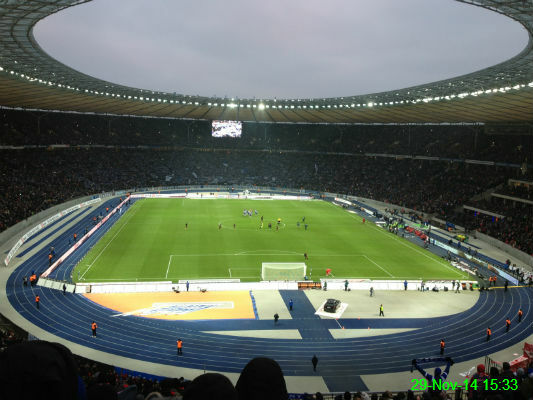 Day two of sporting events in Berlin saw us return to the Olympiastadion to watch Bayern Munich beat Hertha BSC 1-0. It was definitely the coldest I've ever been in my life! Instead of going down the road to Whitley Bay, I went to Berlin for my first ice hockey game. 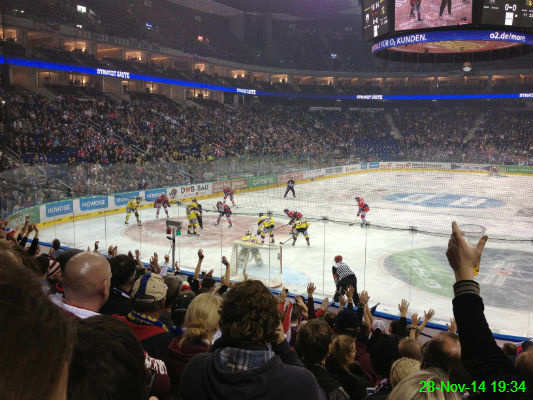 Eisbären Berlin beat Krefeld Pinguine and the atmosphere was fantastic. Everyone knows that one of the most crucial things to do before going away for the weekend is to watch as much recorded TV as possible to free up space on your Sky box. 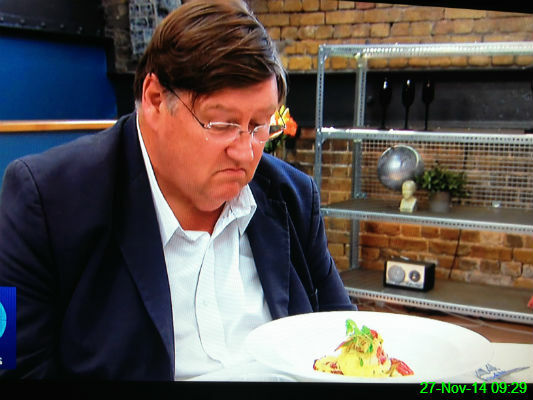 In my case this involved binge-watching Masterchef: The Professionals and I was very impressed at Charles Campion's glum face. 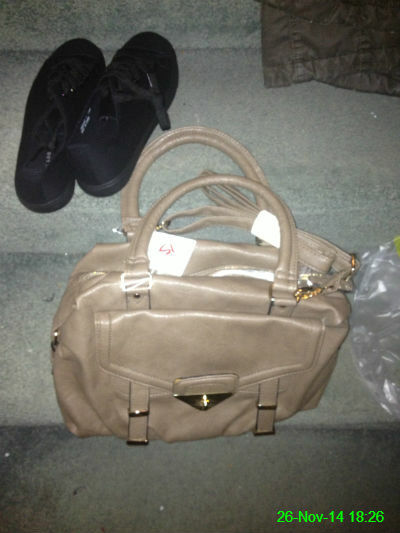 I bought a new handbag since my current one is falling to pieces. 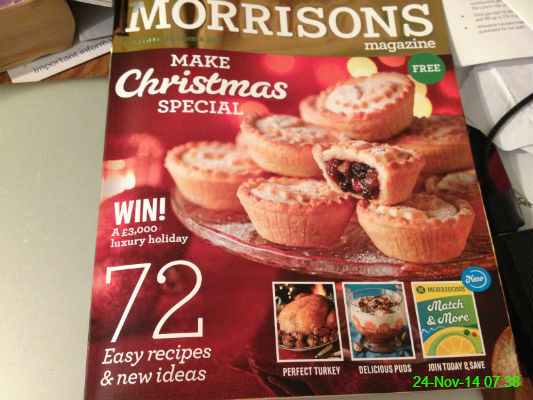 I'm not sure I like it, but at least it doesn't have holes everywhere. 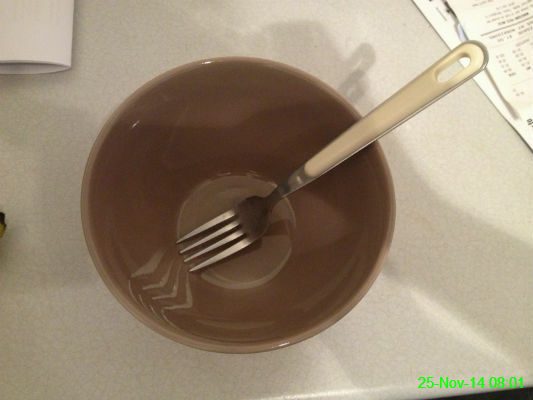 I must've been having a bit of a brain fart when I got the dishes ready last night for breakfast this morning, since I'll almost certainly struggle to eat a bowl of Weetabix with a fork. Hopefully I'll pick up some tips as I work my way through this. 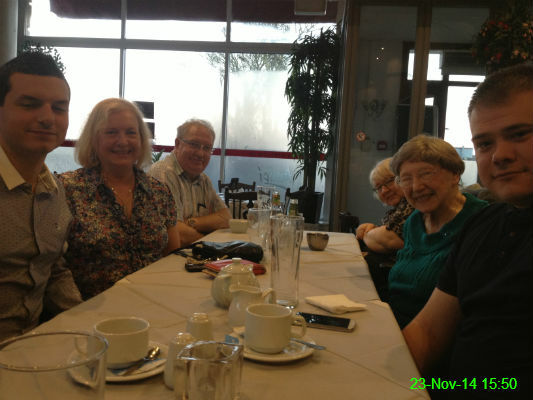 It feels like ages since we've had a family meal out so it was great to see Nasser, Sue, Chris, Mam, Gran and Michael all in one place - Amici. 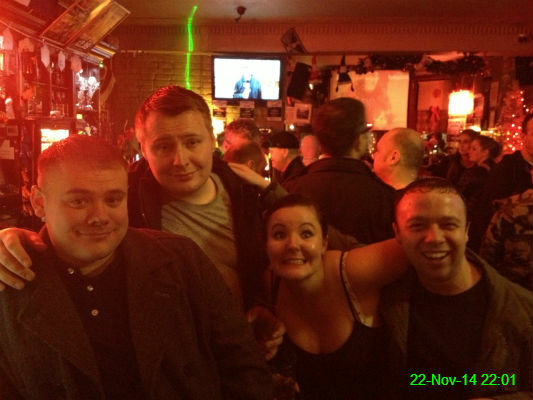 Michael, James, Nicole & Craig in the Percy Arms. Other than the varying facial expressions, the most exciting thing about this photo is probably the fact that I took it at the same time as yesterday's! 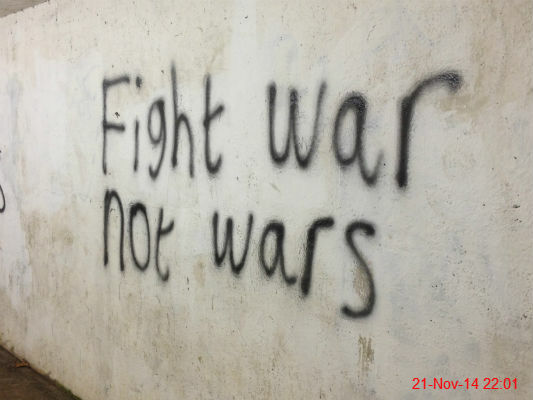 I think someone was trying to be profound. 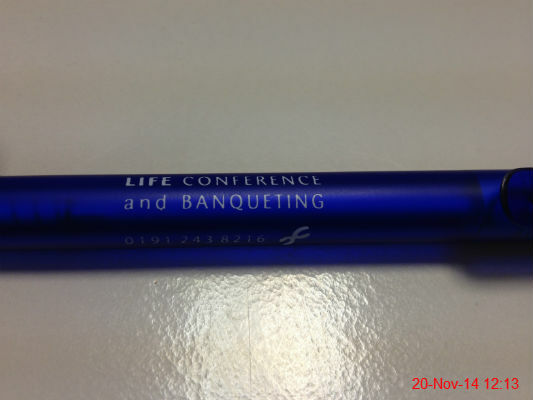 Nicola brought me a free pen from a conference at the Centre for Life. I bought a box, therefore it would seem I have given a bowl. I had a very out of character moment and decided to skip the gym and go clothes shopping instead. 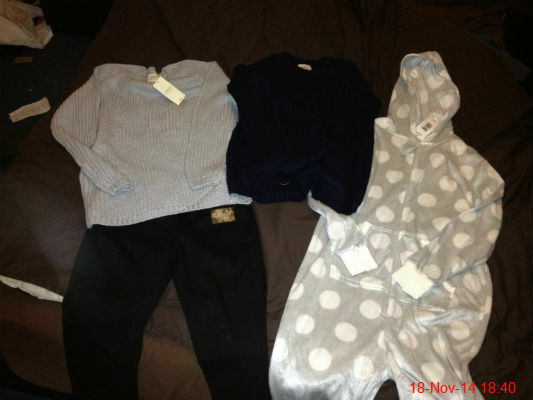 I bought some jumpers, a pair of jeans and a onesie. Oh and some Christmas socks, which I'll photograph closer to the time. All because I had a voucher for 10% off! This has been on the fridge for a few weeks now and unfortunately it doesn't seem to be doing the trick. 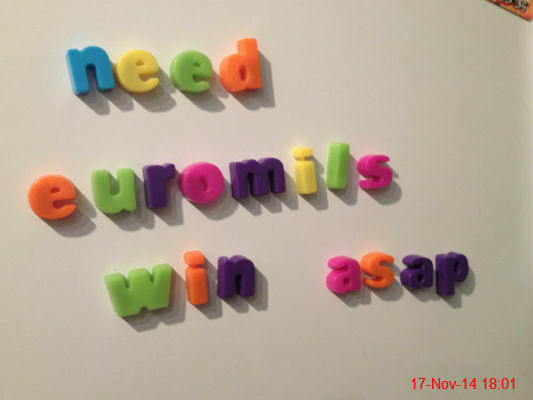 Maybe I'll have more luck if I actually spell Euromillions out properly, so fate knows what I mean. 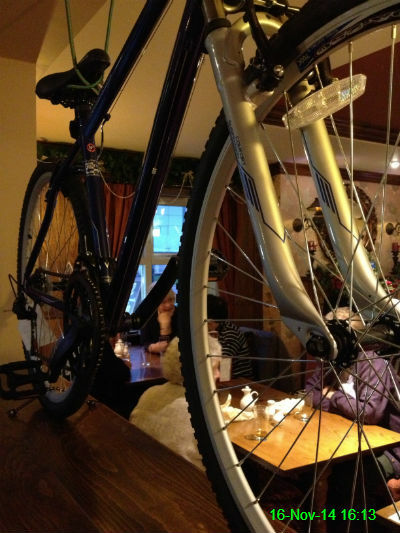 There was a bike in the Shire Horse. I don't know why. 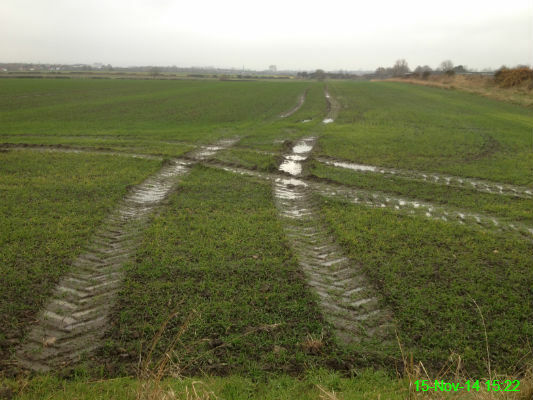 It was a fairly decent afternoon so I went for a walk, but some of the fields were still a bit muddy from recent rainfall. My Friday treat was something I'd never tried before. 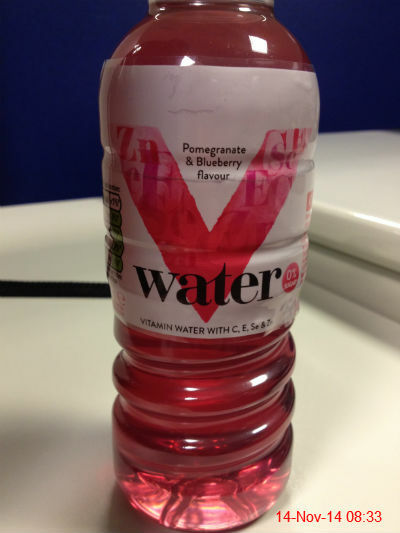 I wouldn't say I hated it, but it definitely wasn't the nicest drink I've ever tasted. 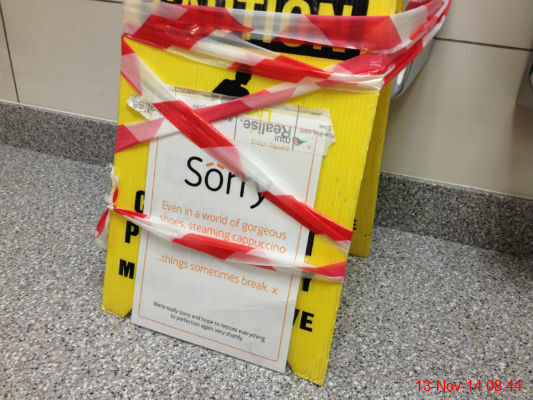 This seemed a very extreme way of pointing out that the hand dryer isn't working properly. 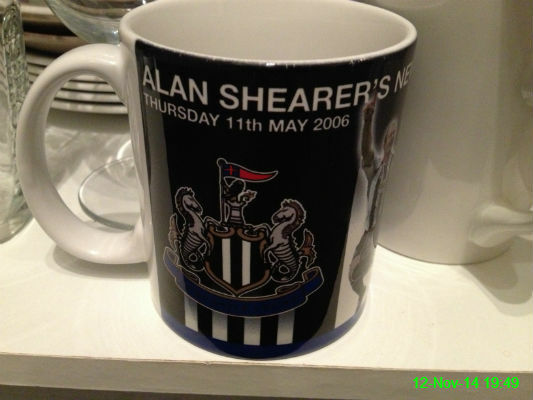 This mug, to commemorate Alan Shearer's testimonial match, is my preferred item to crack eggs against. I don't know why. I was at the match, but I don't remember anything to do with eggs. 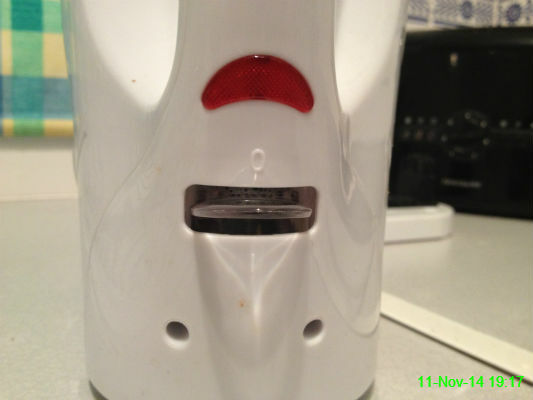 The switch on my kettle looks a bit like an upside down face. We celebrated Rachel & Ron's wedding at St Gabriel's Church followed by Jesmond Dene House. 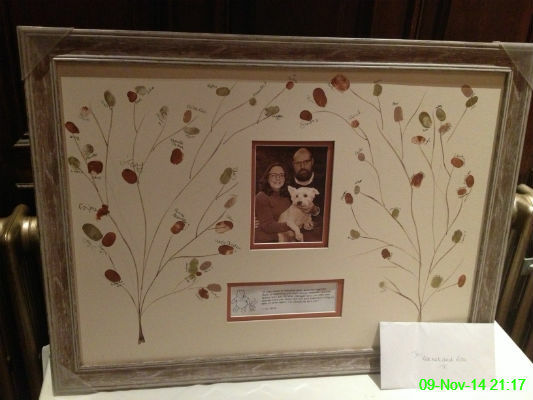 They asked guests to add their fingerprint to this tree which was a really cool touch. I should really stop giving people such easy access to my fingerprints! 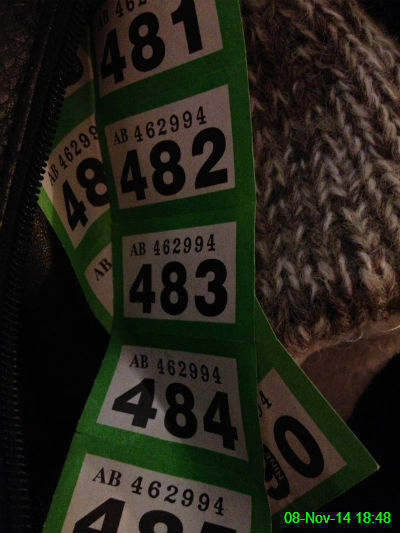 We ended up buying tickets for the Grey Horse Christmas raffle. I suspect we may end up with several more of these by the time the raffle is drawn. 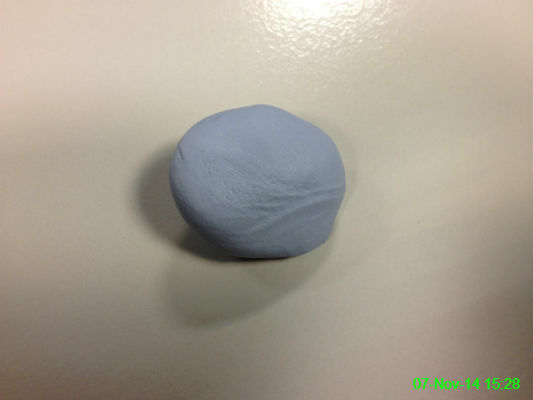 I love having a bit of Blu-Tack to mess around with! I hadn't seen any for years until Lorraine donated this to me. If you look closely you could probably pick out part of my fingerprint... please refrain from stitching me up for a crime. 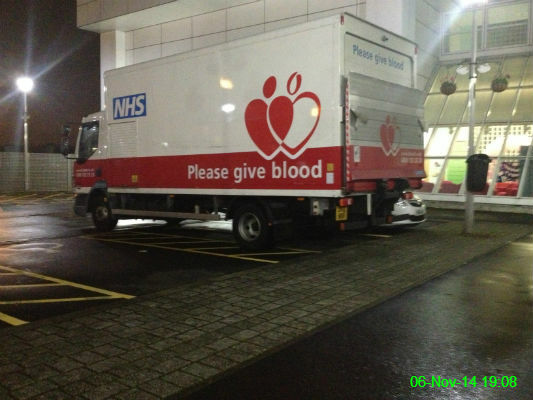 If you are able to, please give blood. 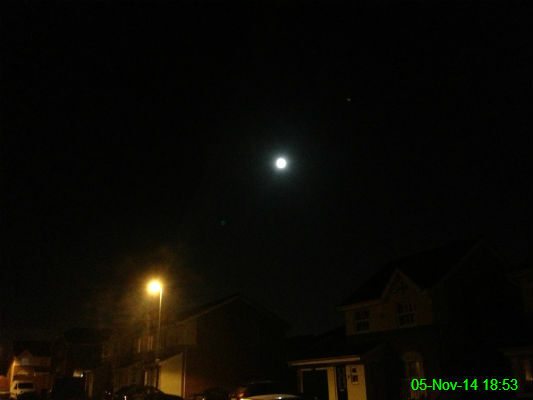 I'm not a fan of fireworks so this was the prettiest thing in the sky for me tonight. Not an infestation! 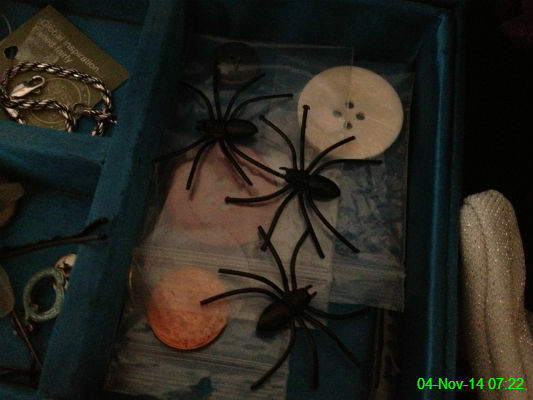 I accidentally brought these home in my pocket from a pub where they were up as Halloween decorations. 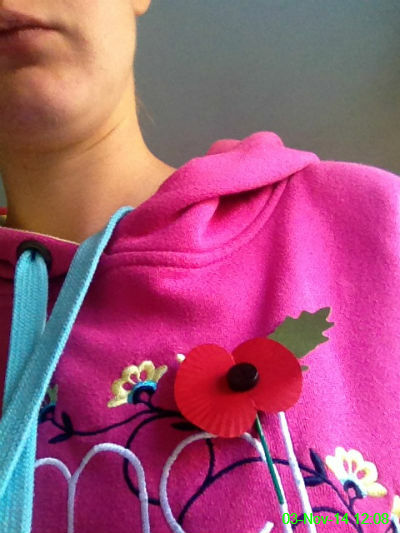 It doesn't go very well with my outfit today but I've got my poppy pinned into place. 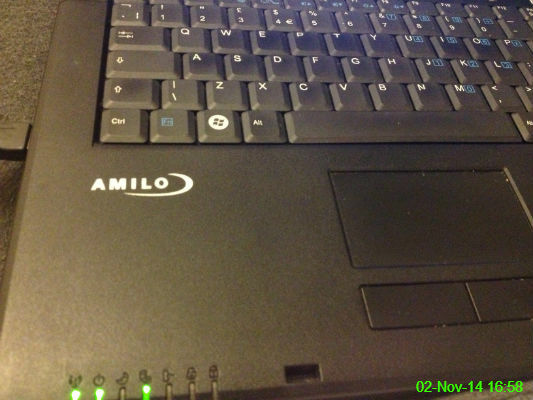 Michael spent today working on this laptop which I've borrowed from my mam, since I was having to constantly hold the charger in place while using my own. It's a lot quicker now he's worked his magic. 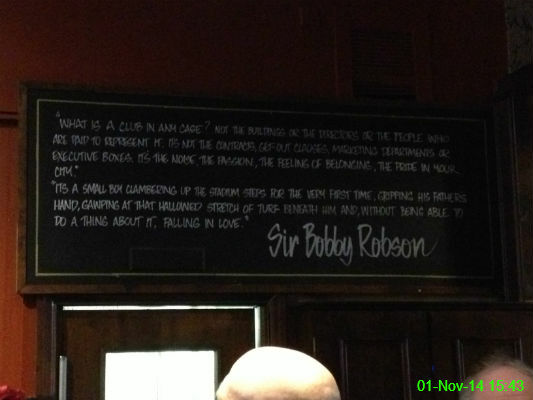 This isn't a great photo unfortunately, but I love this quote from Sir Bobby Robson: "What is a club in any case? Not the buildings or the directors or the people who are paid to represent it. 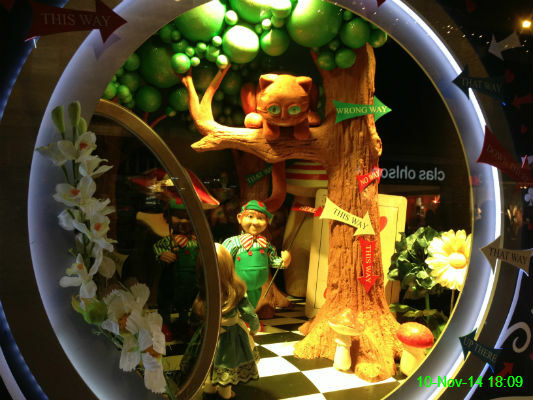 It’s not the television contracts, get-out clauses, marketing departments or executive boxes. It’s the noise, the passion, the feeling of belonging, the pride in your city. It’s a small boy clambering up stadium steps for the very first time, gripping his father’s hand, gawping at that hallowed stretch of turf beneath him and, without being able to do a thing about it, falling in love."